The ranges of no till harrows from Agmaster are made to complement no till seeding systems. The rotary actions brush loose soils from the interows back into the seed row. With a great trashflow capability, the till harrows can be used independently or in combination with press wheels. 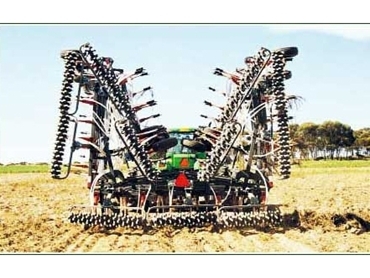 The no till harrows are easy to set up and use, excellent for stubble handling and adjustable with working angles and pressures. Agmasters range includes coil harrow gangs which are ideal from when the soil is sticky to cover a greater variety of points. Star harrow gangs are also available for covering behind narrow points to provide an even cover.